Well, first off let me say that I’m deeply sorry for my month-long hiatus. In case you’re wondering why I fell off the face of the earth, my own little world has been completely turned upside down. Between traveling to the Far East (work, not pleasure), a quick, unexpected move, and taking on another job– lets just say I’ve been a bit preoccupied. Things are starting to reach some level of normalcy, so I’m back in the kitchen and ready to cook. 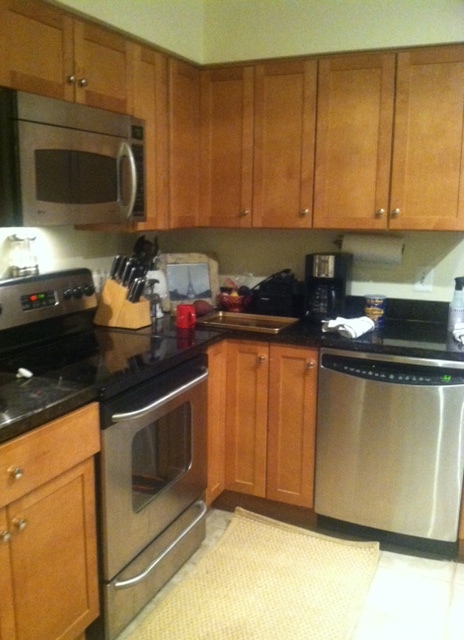 I even have a new and improved kitchen! Photo below…please excuse the mess. We are still unpacking. So, in honor of football season and stress eating, I thought I’d try my hand at buffalo wings tonight. I am a very picky wing eater. I think ever since I discovered that most restaurants use frozen, year-old chicken wings packed with hormones and other unnatural substances I’ve been a bit turned off by this classic American fare. Not to be a wing snob, but they need to be fresh, light(ish) and free of fat and chemicals for me to enjoy them. Ok, I will make an exception. I’m probably one of five girls that actually enjoys going to Hooters. Not for the hooters themselves, but for the wings. I highly doubt that Hooters uses farm fresh organic chicken wings, but I’m willing to make an exception. Funny story- when I was in Japan last month (home of the world’s most Michelin Star restaurants), I was DYING for buffalo wings. I know that sounds crazy, but come talk to me after eating sushi for a week straight. If you’re ever in Tokyo, you have to check out the Hooters in Ginza. Not only was I the only female in the restaurant, but the food is actually better than what we get stateside and the waitresses are hilarious. They totally play in to the stereotypes and I love it. Not to go off on a tangent, but I think anyone that sees Hooters as being “degrading to women” should take a flying leap. It’s a business. It’s successful. And oh by the way, nobody is FORCED to work there. Most importantly their wings and curly fries rock. The next best thing to Hooters is to make wings yourself. Tonight I wasn’t in the mood for deep-fried anything, so I decided to bake these suckers. The trick is to coat them in plenty of flour and spice to ensure a nice crisp texture. The result? Fantastic. Preheat oven to 400. Line a large baking sheet with aluminum foil and spray lightly with nonstick spray. Combine flour, cayenne, garlic powder and salt. Rinse and pat dry chicken wings. In large bag, shake and coat wings with flour mixture. Place wings in refrigerator (on cookie sheet) for 45 minutes. Whisk 1/4 c melted butter and 1/4 c hot sauce. 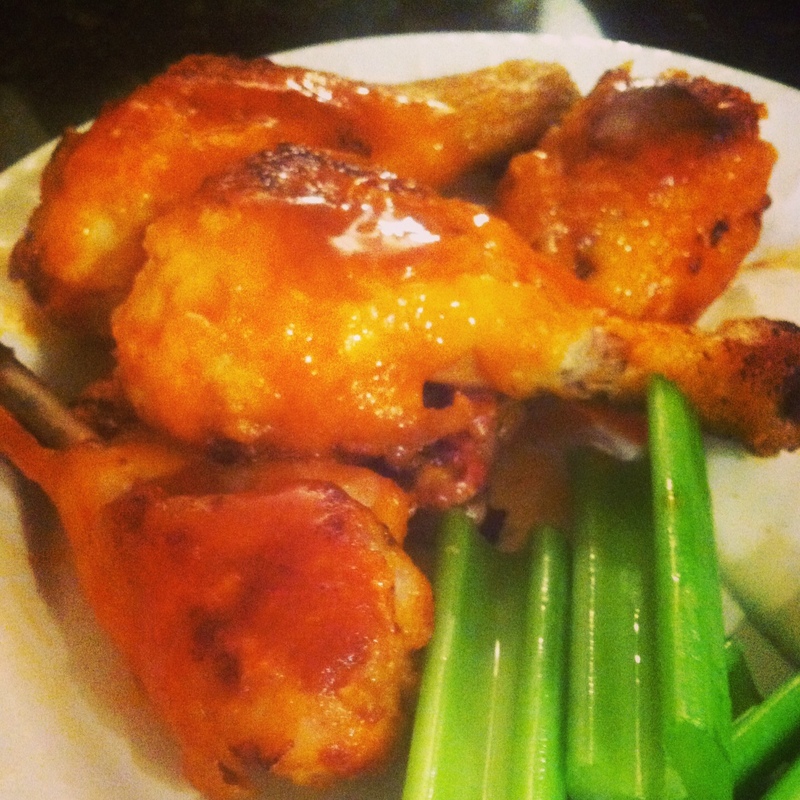 Dredge chilled wings in buffalo sauce then bake for 40 minutes, flipping them halfway through. Combine leftover (melted) butter and hot sauce. Once wings are done, drizzle more hot sauce on them. Serve with celery stick and ranch or bleu cheese dressing.